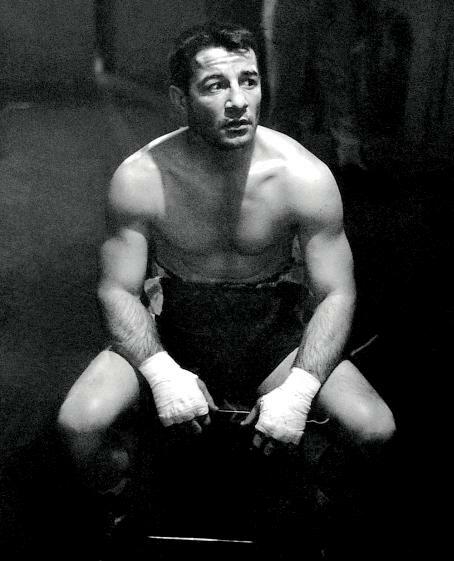 In 1945 Rocky Graziano stood at the precipice of ruin. Just 26-years-old, with a record of 35-6-5, he had lost two matches in a row, two high profile defeats at Madison Square Garden, against fellow New Yorker Harold Green. 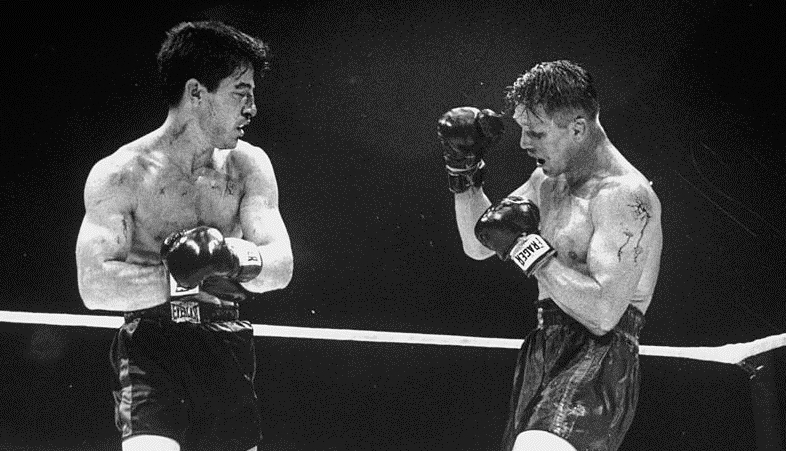 But instead of regrouping and taking on some soft touches, the decision was made to gamble Rocky’s entire career on one fight, another main event at the Garden, this time against impressive young power puncher Billy Arnold. If Rocky suffered a third consecutive defeat it meant the end of his days as a headliner; everything was riding on a single match. A showdown between two power punchers, it was a big draw for the Garden, but Rocky was a six-to-one underdog. And as early as round two it appeared the oddsmakers had called it right. Only 18-years-old, Arnold was a sensation thanks to his crushing power, scoring 27 stoppage wins in his first 28 fights. In the second he had Rocky teetering on the edge, seemingly one punch away from disaster, but Graziano survived and in the third, out of nowhere, he slammed home his big right hand. 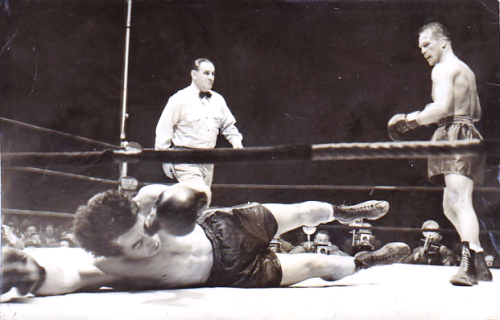 Arnold crashed to the canvas; he rose but went down two more times before the referee stopped the bout. The gamble had paid off; Rocky was back to his winning ways and had restored his reputation as one of the fight game’s most explosive and exciting performers. Later that year he scored a thrilling one punch KO of Green and he was on his way to a title shot. Graziano standing over a fallen Green in their third and final meeting. Time and again Rocky snatched victory from the jaws of defeat with his right hand and now he had put together a streak of big wins over Arnold, Green, Freddie Cochrane, Al “Bummy” Davis, and Marty Servo, Graziano enjoying a weight advantage in most of these tilts, all of them attracting crowds to Madison Square Garden. 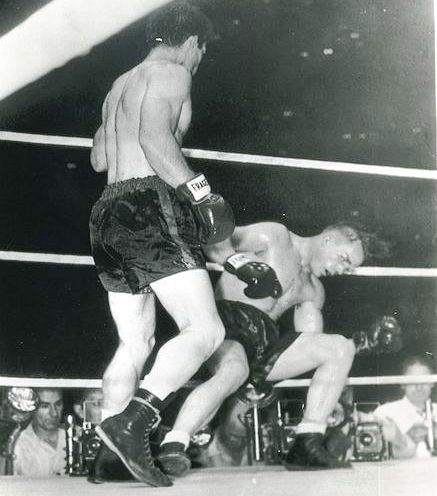 And it was Rocky’s good luck to have waiting for him at the top of the middleweight division one Tony Zale who, as it turned out, was a match made in heaven for Graziano, in part because the champion was 35-years-old and a long time removed from serious competition. 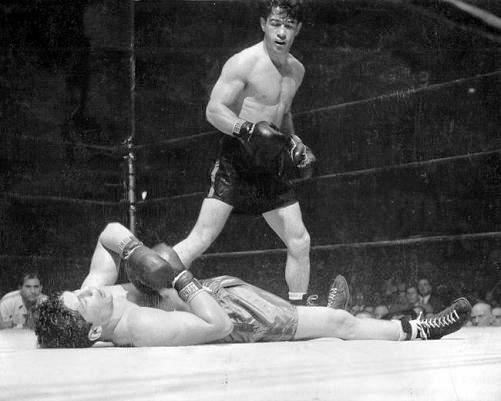 A little incident called World War II had interrupted Tony’s reign; his match against Rocky was the champion’s first title defense in almost five years. And so it proved to be the kind of fight Graziano needed, an all-out, toe-to-toe shootout, and even in defeat the fight only boosted Rocky’s profile and marketability. It was, and is, regarded as one of the greatest slugfests in boxing history. 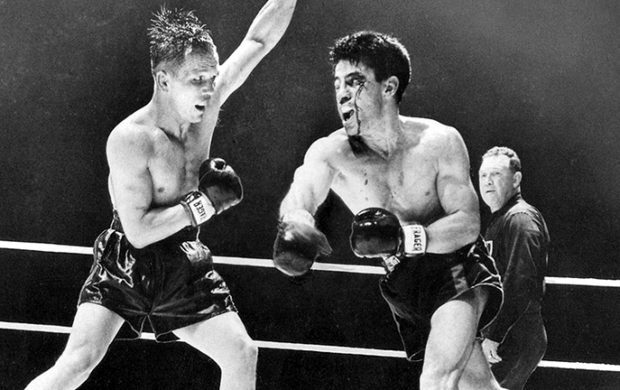 High excitement charged the huge Yankee Stadium crowd from the first bell as the two tough middleweights wasted no time in throwing their hardest shots. Zale floored Rocky with a wild left hook in the opening frame but the challenger scrambled to his feet and tore back in for more. 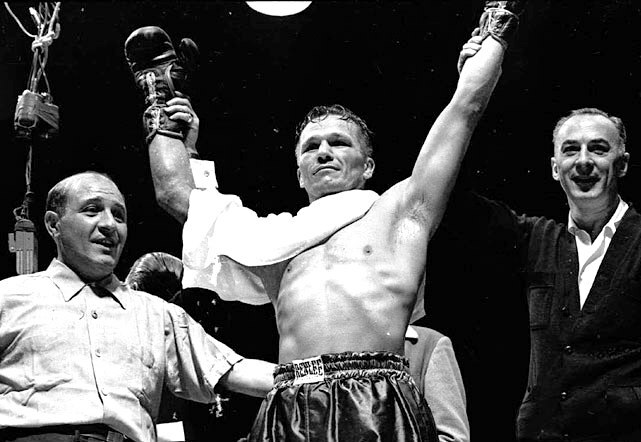 It was non-stop, fast-paced, toe-to-toe brawling with Graziano dominating the second round, splitting open Zale’s lip and decking him at its end, the bell saving the champion from what looked like certain defeat. The younger and fresher challenger continued to attack in the third, chasing Zale all over the ring and landing heavy punches, but to everyone’s astonishment “The Man Of Steel” came back in round four. 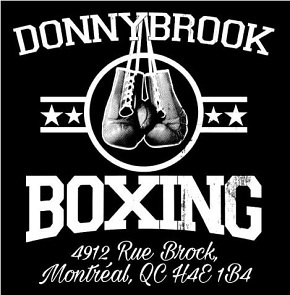 Digging both fists to Rocky’s belly and backing his man up, Tony rode the momentum into the fifth before the tables suddenly turned again and it was Graziano’s turn to unleash a two-fisted attack, the champion now hurt and seemingly one punch away from oblivion. Tony did and thus saved his title. Graziano, looking to end it, attacked, throwing a long fusillade of blows, and when he stopped to take a breather, Zale, one of boxing’s all-time best body punchers, stepped in and sunk home a booming right hand to the challenger’s belly. The punch froze Rocky and he never saw the left hook that exploded on his jaw and sent him to the floor where he was counted out for the first time in his career. Rocky down in the first great Zale vs Graziano slugfest. That electrifying first Zale vs Graziano clash was of course The Fight Of The Year for 1946 and no time was wasted in putting together a rematch, initially scheduled for March at Madison Square Garden. 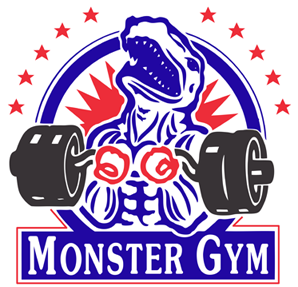 But the New York State Athletic Commission suspended Graziano’s license for his failure to report a bribe attempt, a charge later thrown out for lack of evidence. Zale vs Graziano II was rescheduled for July in Chicago and Tony’s hometown fans from nearby Gary, Indiana helped Chicago Stadium set a new indoor gate record, with some nineteen thousand filling the stands. And if the fans of “The Man Of Steel” didn’t leave happy that night, they still got more than their money’s worth as Zale and Graziano once again put on a spectacular slugfest. This time it was Graziano who appeared to have too much to overcome as the first round saw Zale take charge and land a series of punishing blows to both body and head and by the end of the round the challenger’s right eye was swollen and closing fast. 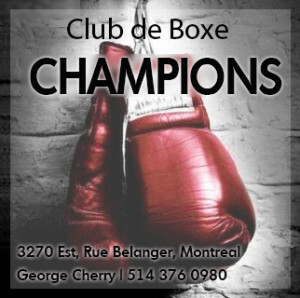 The champion only picked up the pace in the second as he sought to capitalize on the injury, but then Rocky got home his right hand, the punch stunning Zale and at the bell he went to the wrong corner. But round three was all Zale; he inflicted a nasty cut over Graziano’s left eye, scored a knockdown, and then pinned Rocky to the ropes with a fearsome assault. At the bell, the challenger’s face was a mask of blood and the referee told Rocky he would stop the fight if he continued to take such punishment. Despite this, round four was more of the same as the breakneck pace continued and Zale looked to end it, while Graziano was clearly bothered by his wounds and having trouble with his vision. Before round five Graziano’s corner took drastic action to restore their man’s sight, breaking the swelling around his right eye and pressing it with a coin. Perhaps the pain of these procedures awakened something primal in Rocky, or maybe his improved sight gave him newfound energy, for the challenger tore out of his corner and attacked with abandon in round five, and indeed his accuracy was much improved as he dramatically reversed the momentum and found the range for his bombs, bringing loud exclamations from the crowd as he landed one huge punch after another. To everyone’s astonishment, the fighter who had appeared finished just minutes before was now in charge and inflicting serious damage. Zale reels from Rocky’s attack in round six. Zale attempted to rebound at the start of round six, but he was fading and Rocky knew it. The challenger kept charging forward behind his cannon of a right, battering Tony from one side of the ring to the other. Three flush right hands sent Zale down, and though he gamely climbed to his feet, he was almost driven out of the ring by the fury of Rocky’s follow-up attack. 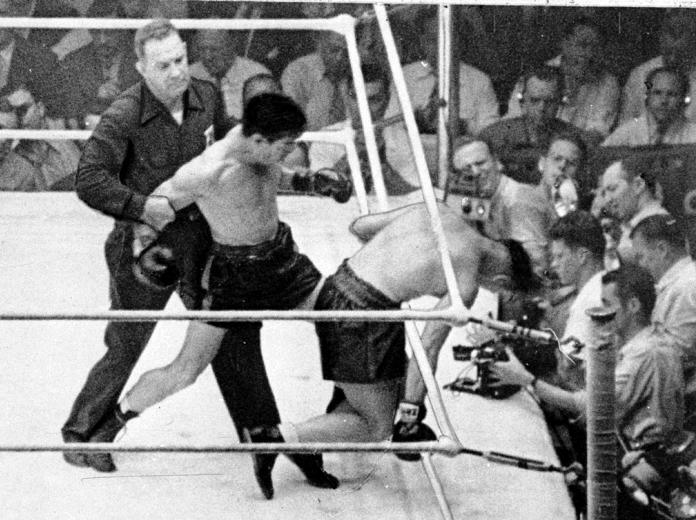 Draped over the middle strand of the ropes, his back turned to Graziano, Zale was defenceless and the referee halted the match at 2:10 of the round.